★ PSSSST: want to learn how to secure this clip art for your digital interactive resources? Check out this video e-course on how to make resources for a digital classroom! 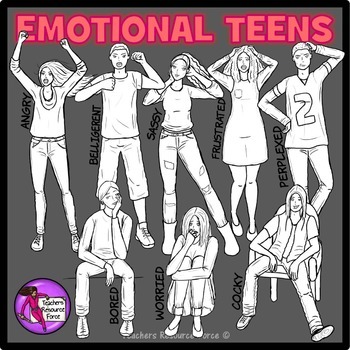 This set includes super fashionable and detailed illustrations of emotional teenagers! Please note: as they are exclusive, Premier Illustrations will not be included in any bundles. • Receive free TPT credits to use on future purchases by going to your 'My Purchases' page in your account. Simply click the 'provide feedback' button and you will be taken to a page where you can rate and comment on the product. Each time you give me feedback, you earn 'feedback credits' that you can put towards future TpT purchases to reduce their costs! • Be the first to know when I upload new products, discounts and freebies by clicking on the green star next to my store logo to become a follower! 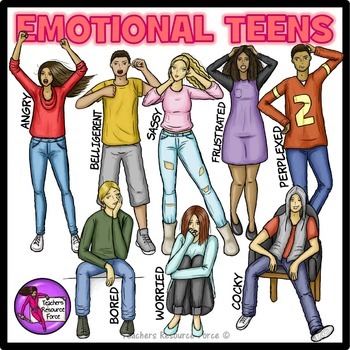 • If you use any of my clip art in the front covers of your resources, simply drop me at email and I'll feature your product on my special Pinterest Board!